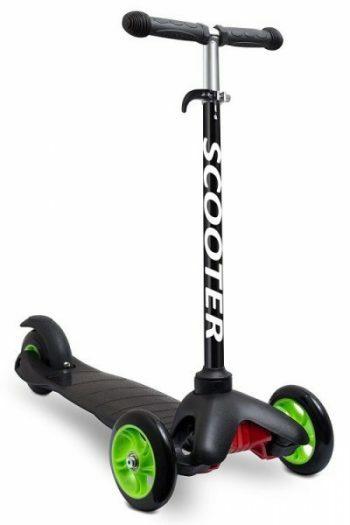 One of the most popular gift options for children is a scooter. A scooter is a fantastic precursor to a bicycle, and can teach children balance and coordination. There are a lot of options when it comes to finding the best scooter for your child, so we took the work out of it and did the research for you. Consider whether or not your child is new to scooters, color preferences, and ease of learning; some scooters take longer to learn, depending on the rider’s ability and experience. Here are the top 10 best scooters for kids in 2018. This 3-wheeled scooter from Razor is a great choice for younger children; the Kiddie Kick Scooter is appropriate for children as young as three. The low-lying deck is slip-resistant, and the scooter features a new folding mechanism, making it easy the carry and transport. 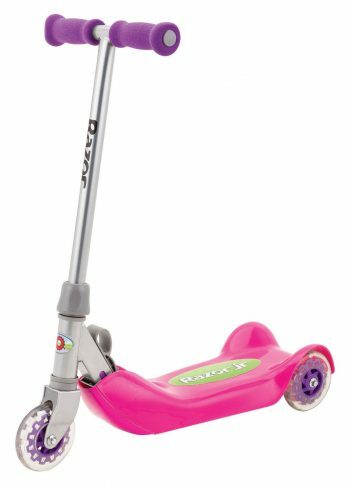 The scooter comes in a blue/orange color scheme and pink/purple. This adjustable scooter is suitable for children as young as two years old. You can keep this scooter as your child grows, by simply adjusting the height of the handlebar. 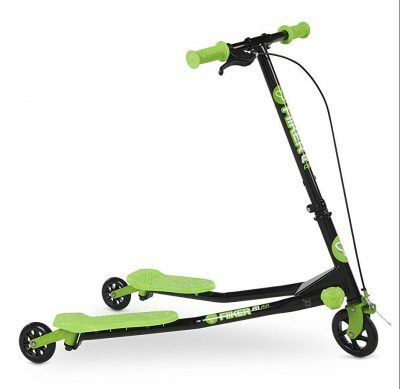 The low deck is reinforced with steel for added support, and the rear brake covers a larger area, allowing for efficient braking, This model is a great progressive scooter for children ages 2-6. This is a great option for new riders. The scooter features two wheels in the front for stability and better control. The steering mechanism requires the rider to lean to steer, teaching children balance and coordination. For added stability, the deck sits lower to the ground than other models, giving the rider additional balance. 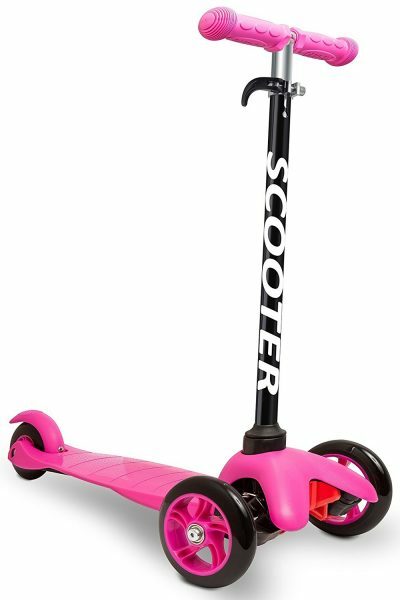 You can get this scooter in a variety of color options: pink, blue, orange, and green. The Maxi, by Micro, comes in a rainbow of colors designed with children in mind. The Maxi has a unique feature in that all parts are replaceable, meaning you can keep riding it virtually forever. The steering mechanism acts similarly to the motions that come with riding a skateboard, but the three-wheeled design adds extra maneuverability and stability. This model is perfect for the elementary aged child. A classic option from a classic brand, this kick scooter features a wide base and two front wheels for stability and easy steering. This is a fantastic option for young children up to 50 pounds, and the attention to design makes this easy to learn how to use, especially for ne riders. 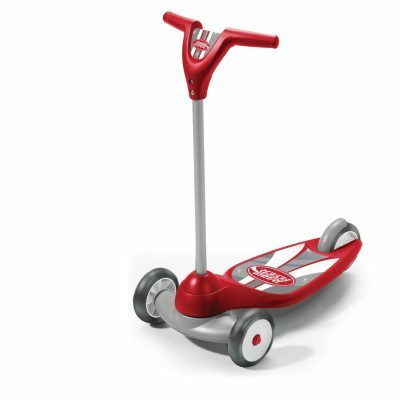 Your child will learn coordination and balance, and can scoot around the neighborhood in style; the scooter comes in the Red Flyer signature red. This is another quality product from OxGord, crafting durable, reliable kick scooters for children. OxGord’s notable feature is the three-wheeled design, providing stability and safety for even the newest riders. The folding design makes this ideal for carrying when you’re not riding. The three-wheeled design also eliminates the need for a kick stand, and the handles are covered with a comfortable grip material for easy handling. This unique scooter by Yvolution is shaped like a flying ‘v’, and you can steer and move with only the motion of your hips and legs. This three-wheeled scooter uses a hand brake that is great for quick stops without fear of falling. This particular model is recommended for children as young as 5 years of age, or 44.5 inches tall. The steering mechanism is very easy to learn; young children will get the hang of it in minutes! OxGord has produced a fantastic three-wheeled scooter that provides stability and safety. 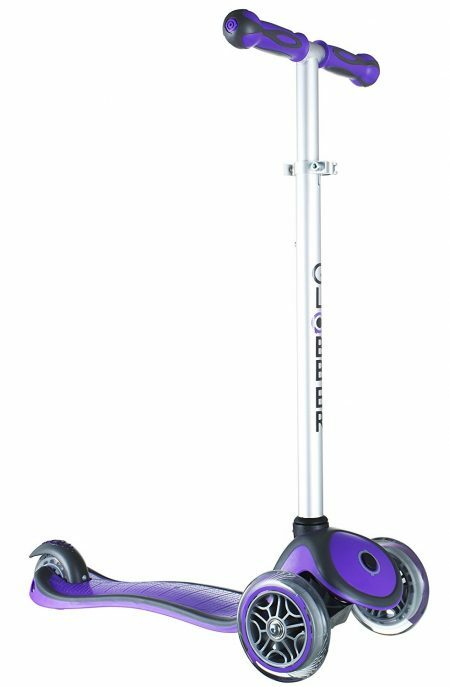 A child of any skill level can get started on this scooter, where there is no need for a kickstand or fear of falling over. You’ll be assured your scooter will last for years, as it is has a highly-durable aluminum frame and a carbon steel alloy handle bar. At the rear wheel of the scooter you’ll find an easy-to-use braking mechanism that can bring you to a quick stop. Razor’s compact kick scooter is perfect for the novice rider. The scooter features a unique three-wheeled design, making it extra stable and giving confidence to new riders. 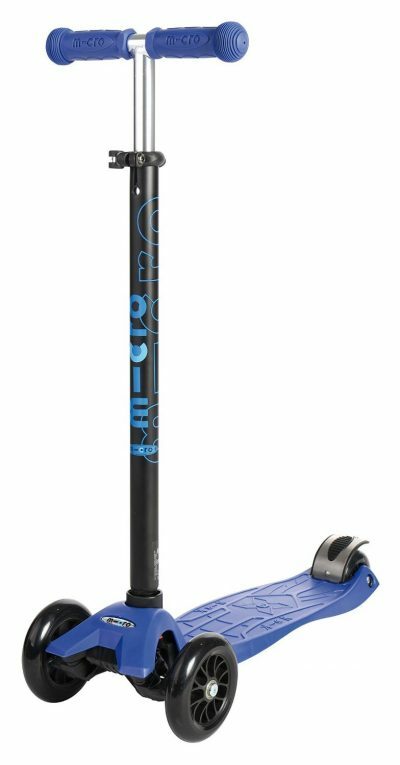 The scooter, from reputable manufacturer Razor, is constructed from durable steel, aluminum, and plastic. The deck of the scooter is slip resistant, and the handles are easy for children to grip. When you’re not riding, the scooter folds up for easy carrying. This kick scooter by Micro Kickboard is the best kick scooter on the market. It comes in a variety of colors designed to make any kid happy. 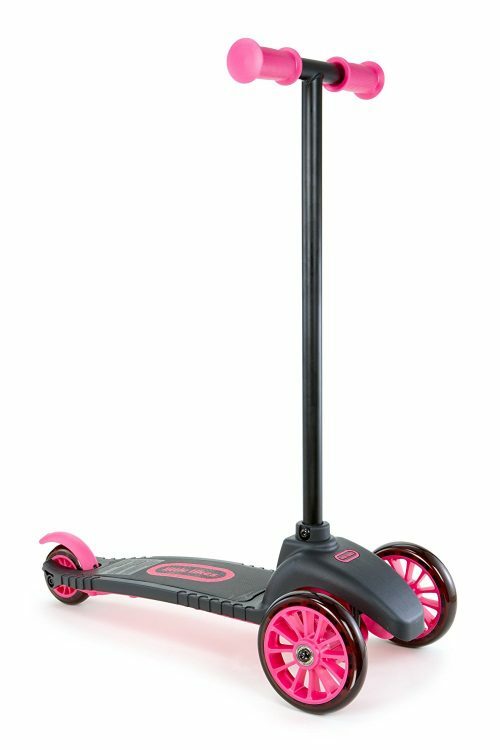 Like other kick scooters, it features a rear wheel brake and easy-to-grip handles. 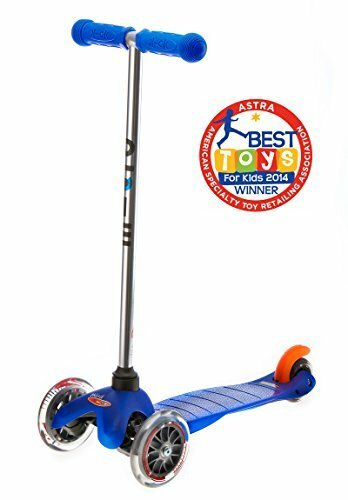 This is the best-rated scooter for 2-5 year olds, and it features and easy-to-learn steering mechanism using their bodyweight to guide the scooter. This type of steering system helps develop balance and coordination. Whether you’re looking for a gift or simply a way to encourage a child to spend more time outside, scooters are highly popular and great for younger children. These scooters are the best we’ve found on the market; one of them will fit your needs and your budget. There are scooters for children as young as two or three. Consider whether this will be something your child will want to use for a long time – consider scooters that can grow with your child. Scooters come at a variety of price points, so you’ll be certain to find the best scooter for your family’s budget.